Spanish astronomer, historian, and philosopher; born at Toledo about 1110; died, according to common report, a martyr about 1180. His mother belonged to a family famed for its learning. His chronicle, a work written in 1161 under the title of "Sefer haḲabbalah" (Book of Tradition), in which he fiercely attacked the contentions of Karaism and justified rabbinical Judaism by the establishment of a chain of traditions from Moses to his own time, is replete with valuable general information, especially relating to the time of the Geonim and to the history of the Jews in Spain. An astronomical work written by him in 1180 is favorably noticed by Isaac Israeli the Younger ("Yesod 'Olam," iv. 18). His philosophical work, "Al-'akidah al-Rafiyah" (The Sublime Faith), written in 1168, in Arabic, has been preserved in two Hebrew translations: one by Solomon b. Labi, with the title "Emunah Ramah"; the other by Samuel Motot. Labi's translation was retranslated into German and published by Simson Weil. Ibn Daud was by no means an original thinker, nor did he produce a new philosophy; but he was the first to introduce that phase of Jewish philosophy which is generally attributed to Maimonides and which differs from former systems of philosophy mainly in its more thorough systematic form derived from Aristotle. Accordingly, Ḥasdai Crescas mentions Ibn Daud as the only Jewish philosopher among the predecessors of Maimonides ("Or Adonai," chap. i.). 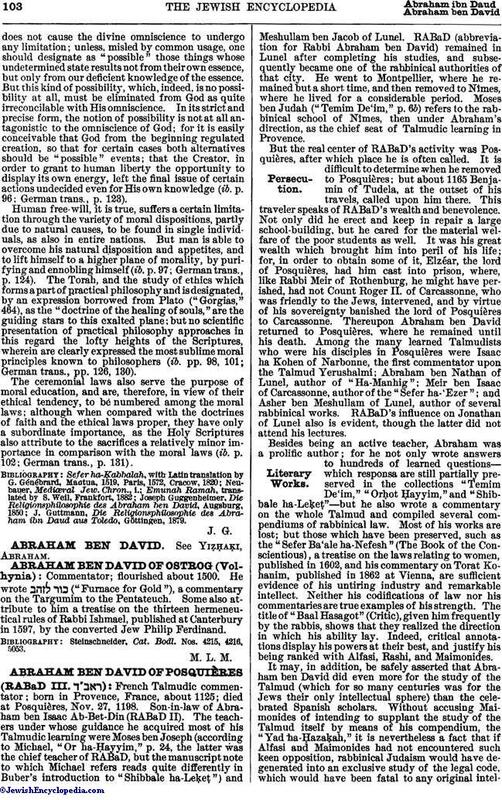 But having been completely overshadowed by Maimonides' classical work, the "Moreh Nebukim," Abraham ibn Daud's "Emunah Ramah" (Sublime Faith), a work to which Maimonides himself was indebted for many valuable suggestions, received scant notice from later philosophers. The only Jewish philosophical works that Ibn Daud had before him, according to his own statement ("Emunah Ramah," p. 2, or in German trans., p. 3), were Saadia's "Emunot we-De'ot," and "The Fountain of Life" by Solomon ibn Gabirol. On the one hand, he fully recognizes the merits of Saadia, although he does not adopt his views on the freedom of the will, notwithstanding that the solution of this problem was to be the chief aim and purpose of his whole system ("Emunah Ramah," p. 98; German trans., p. 125). On the other hand, his attitude toward Gabirol is entirely antagonistic, and even in the preface to his "Emunah Ramah" he pitilessly condemns Gabirol's "Fountain of Life." See Kaufmann, "Studien über Solomon ibn Gabirol," Budapest, 1899. Being the first strict Aristotelian among the Jews—who considered Aristotle and his Arabic commentators, Alfarabi and Ibn Sina, to be the only true philosophers (ib. pp. 23, 50, 62; German trans., pp. 30, 65, 78)—Ibn Daud feels himself provoked to constant opposition by the doctrines of Gabirol, who represents the Neoplatonic philosophy. Impartial enough to accord to childlike faith its full rights, Ibn Daud desires also to defend the rights of reason, and, consequently, resists with the utmost energy any attempt to set bounds to science; regarding this as a culpable encrcachment upon the plan of the Divine Ruler, who did not endow man with the faculty of thought without intent. True philosophy, according to Ibn Daud, does not entice us from religion; it tends rather to strengthen and solidify it. Moreover, it is the duty of every thinking Jew to become acquainted with the harmony existing between the fundamental doctrines of Judaism and those of philosophy, and, wherever they seem to contradict one another, to seek a mode of reconciling them. Ibn Daud insists that, however highly philosophy may be valued, the religion of Judaism is preferable. Knowledge, which had been acquired by philosophers through the evolution of several thousands of years, and after overcoming the gravest errors, had been bestowed upon Judaism from the beginning through revelation (ib. p. 62; German trans., p. 79). As to moral truths, it may be even assumed as probable that the philosophers did not attain to them through independent study, but rather under the influence of the doctrines of Holy Scripture (ib. p. 101; German trans., p. 130). It is true that on certain points Ibn Daud could not always avoid conflict with the doctrines of Aristotle: this was especially true in regard to the latter's theory of the Creation. According to Aristotle, all coming into being results from the fusion of matter into a certain form; matter, therefore, is the necessary basis for any genesis; primary matter itself, as the substance common to all things existent, must, therefore, be without beginning and must be eternal. But the acceptance of preexistent and eternal matter can not be reconciled with the Biblical history of creation, which implies a creation out of nothing, and subject to time. From this conflict, which later caused Maimonides to dispute the authority of Aristotle in all matters transcendental, Ibn Daud was not able to extricate himself; and, therefore, he rather tries to glide over the existing difficulties than to solve them. For he represents the course of creation as a series of creative acts; which recalls Gabirol's doctrine concerning the succession of the various substances. But he himself subsequently admits that this was only a hypothesis to satisfy the need of giving an architectonic finish to our notions, intended to mark that gradual process of things which would result, had creation really gone through all the stages of existence, from primary matter, which is imperceptible to us, to all individual things, though some of these stages may be regarded as partly existing only in abstract notions. To concede the possibility of such a gradual process of creation, however, would be, according to Ibn Daud, a contradiction of our conception of God's mode of acting. As to the doctrine of God, Abraham ibn Daud,like Aristotle and his Arabic interpreters, proceeding from the principle of motion, and basing his argument upon the proof of the impossibility of a regressus in infinitum, arrives at the conception of a First Cause of all motion, or of a Prime Mover, who Himself, as First Cause, can not have any other cause of motion above Him, and must, therefore, be thought of as motionless. The Prime Mover is God. But this proof of the existence of God leaves still open two important questions relating to the truth of our knowledge of God: one concerning the incorporeality, and the other respecting the unity of God. As to the incorporeality of God, it follows logically from the notion of infinity which belongs to the First Cause of motion that no corporeal thing can be infinite itself; nor can infinite force be attributed to it. But the Prime Mover is infinite; for, since He Himself is without motion, His force also remains unaffected by the motion of change and transformation. Therefore the Prime Mover—that is, God—can not be corporeal (ib. p. 47; German trans., p. 60). But as a being of necessary existence, God must also be absolutely simple and single; inasmuch as the conception of a plurality in His essence would, at the same time, nullify the notion of the necessity of His existence. For the consolidation of this plurality into a unity must have been effected by another being different from itself; hence the existence of this plural being would be no more necessary, that is, determined by its own essence, but would be dependent upon that other being which brought about the unification (ib. p. 49; German trans., p. 63). From the notion of absolute unity results the conception of the uniqueness of God; for if two beings of this kind could exist, the unity of God would be nullified, since to one, at least, of the units a special character must be attributed so as to distinguish it from the other (ib.). With the doctrine of the unity of God is connected the doctrine of the divine attributes, which is preceded in Abraham ibn Daud's system by the doctrine of the negative attributes, already accepted by Baḥya ibn Paḳuda ("Ḥobot ha-Lebabot," i. 10) and by Judah ha-Levi (Cuzari, ii. 2) from the older Arabic theology. According to Ibn Daud, only negative attributes, in the strict and proper sense, can be imputed to God; so that, whatever multiplicity of these negative attributes may be ascribed to Him, no multiplicity in the essence of God can result. Certainly this is equivalent to a renunciation of a positive conception of the Divine Being; for negative statements may suffice to prevent erroneous ideas, but a positive knowledge can never be obtained through them alone (ib. p. 5; German trans., p. 65). Indeed, our whole knowledge of God is limited to two certainties, (1) that He exists and (2) that His essence is incomprehensible (ib. p. 56; German trans., p. 71). In addition to the negative attributes, only relative attributes can be predicated of God; for even these latter, how many soever may be assumed, since they do not apply to the essence of God but only to His relation to the world, produce no modification in the notion of the unity of the Divine Being (ib. p. 54; German trans., p. 69). From the speculative doctrines of faith, the truth of which can be proved only by reasoning, are to be distinguished the historical dogmas whose authenticity is based principally upon divine revelation, or, to speak more exactly, upon the historical tradition of such a revelation (ib. p. 69; German trans., p. 87). The tradition concerning an event that is reported to have taken place publicly before a great body of men, which originated, so to say, under the control of public opinion, without having been disputed by contemporaries, and has descended with an uninterrupted continuity, possesses an argumentativeness which can not be controverted even by the professional logician (ib. pp. 78, 81; German trans., pp. 98, 103). The trustworthiness of historical tradition forms a presumption in favor of the truth of prophecy. In the true sense of the word, according to the axioms established above for the reliability of historical tradition, there can be only assertion of real prophecy when the divine revelations apply to important public matters; while those revelations which pertain to less important matters, or even to the personal affairs of a single individual, can not be classed under this head (ib. p. 71; German trans., p. 89). Thus, as Ibn Daud remarks, perhaps with a reference to the miracles attributed to Jesus, the authenticity of the Torah would be in a sorry plight if, instead of being based on miracles of real historic certainty, such as those of Moses, it were supported merely by miracles of such private character as the resurrections effected by Elijah and Elisha (ib. p. 80; German trans., p. 101). Relying upon the doctrines of Alfarabi and of Ibn Sina, Ibn Daud, whom Maimonides follows in many ways in his conception of prophecy, further sets forth that the gift of prophecy must not be considered as a phenomenon, interrupting the continuity of the development of the human mind, but in a certain sense as the final stage of a natural evolution whose lower phases, though they must be distinguished from prophecy proper, are nevertheless connected with the same faculty through a certain identity of nature. And even if the true stage of prophecy is reached, this gift is, nevertheless, still capable of progressive development, although it may exceptionally at once reach the highest perfection in particularly gifted individuals. The connection between the mind of the prophet and the higher intellects, principally with the Active Intelligence, furnishes a sufficient explanation of the higher cognitive faculty of the prophet, as well as of his power of transcending natural law. Appointed to become an intermediary between God and man, the prophet is elevated almost to the plane of the separated intelligences, or angels (ib. p. 73; German trans., p. 91). Based upon the philosophical system developed above, and after the exposition of the doctrine of faith, the problem of human free-will and its relation to faith in a divine providence, or predestination, may be regarded as much nearer its solution. The objection that faith in a divine providence is inconsistent with the existence of evil in the world, because God can not be the author of evil and good at the same time, is refuted by the fact that evil has no existence in itself, but is only the natural result of the absence of actual good, and that, consequently, evil needs no creator. The defects and imperfections which appear in this world are in nowise contradictory to the wisdom and goodness of God. The defects appear only to a finite conception which considers things separately and in themselves, and not in their connection with the whole. Viewed from a higher standpoint the imperfections adhering to things or individuals would perhaps, in their relation to the whole, even prove to be perfections and advantages (ib. p. 95; German trans., p. 121). The human free-will as a subjective principle has for its objective correlate the notion of possibility, by which one of two alternatives may occur. Thisdoes not cause the divine omniscience to undergo any limitation; unless, misled by common usage, one should designate as "possible" those things whose undetermined state results not from their own essence, but only from our deficient knowledge of the essence. But this kind of possibility, which, indeed, is no possibility at all, must be eliminated from God as quite irreconcilable with His omniscience. 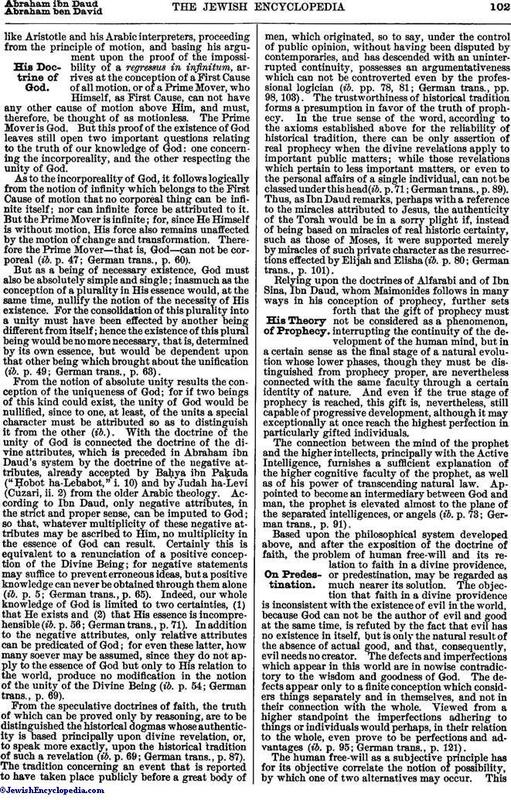 In its strict and precise form, the notion of possibility is not at all antagonistic to the omniscience of God; for it is easily conceivable that God from the beginning regulated creation, so that for certain cases both alternatives should be "possible" events; that the Creator, in order to grant to human liberty the opportunity to display its own energy, left the final issue of certain actions undecided even for His own knowledge (ib. p. 96; German trans., p. 123). Human free-will, it is true, suffers a certain limitation through the variety of moral dispositions, partly due to natural causes, to be found in single individuals, as also in entire nations. But man is able to overcome his natural disposition and appetites, and to lift himself to a higher plane of morality, by purifying and ennobling himself (ib. p. 97; German trans., p. 124). 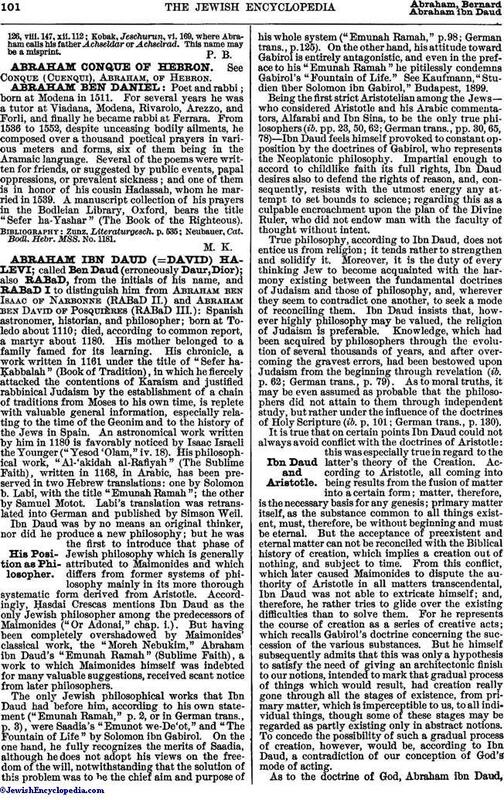 The Torah, and the study of ethics which forms a part of practical philosophy and is designated, by an expression borrowed from Plato ("Gorgias," 464), as the "doctrine of the healing of souls," are the guiding stars to this exalted plane; but no scientific presentation of practical philosophy approaches in this regard the lofty heights of the Scriptures, wherein are clearly expressed the most sublime moral principles known to philosophers (ib. pp. 98, 101; German trans., pp. 126, 130). The ceremonial laws also serve the purpose of moral education, and are, therefore, in view of their ethical tendency, to be numbered among the moral laws; although when compared with the doctrines of faith and the ethical laws proper, they have only a subordinate importance, as the Holy Scriptures also attribute to the sacrifices a relatively minor importance in comparison with the moral laws (ib. p. 102; German trans., p. 131).